You are familiar with Dracubecca? In style it is clear that she comes from Monster high. And external she looks like Draculaura and Robecca Steam combined. Her skin is dark with a pink tinge. She has a nose like a Robecca, and the line of the face like Draculaura. Eyes of lilac. Hair, heart, eye and other beautiful elements you know who gave her? I think that was a very beautiful girl. How do you think? Let's explore together those outfits that have in her wardrobe and choose something very beautiful for her. How to play: in this game you will choose a new dress for beauty Dracubecca. This is the new girl at Monster High. I liked it very much. And you? Played: 29907. Added: 16-11-2015, 20:41. 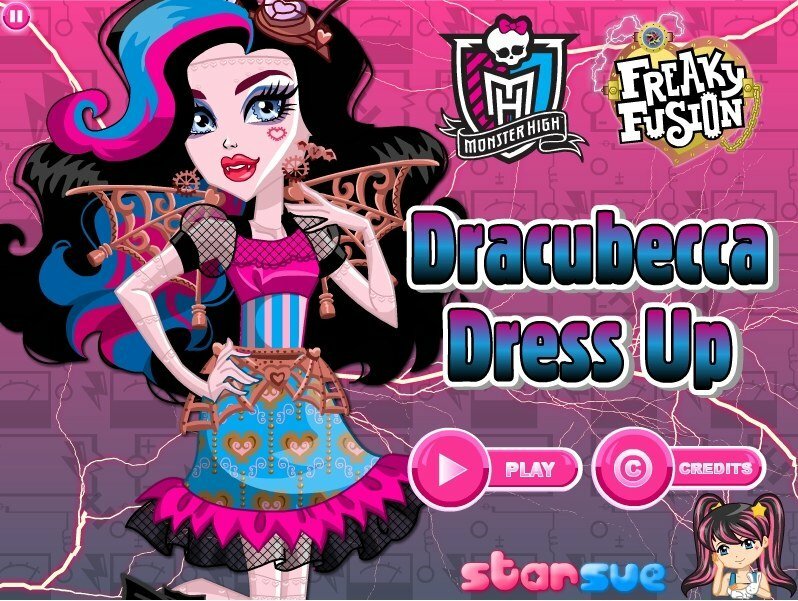 Freaky Fusion Dracubecca dress up game. Choose a new dress for Monster High girl.